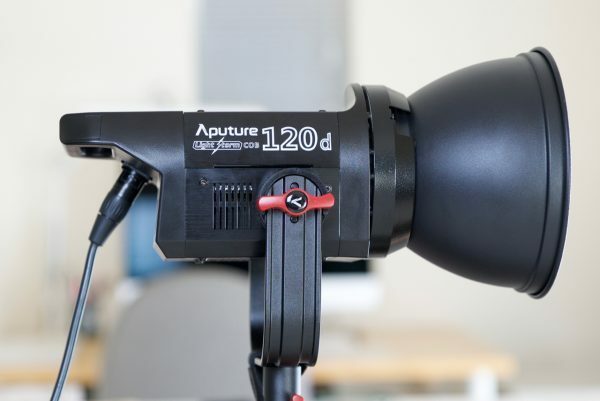 I have reviewed several lights from Aputure on this site and they have always consistently impressed me with their high performance and relatively low cost. 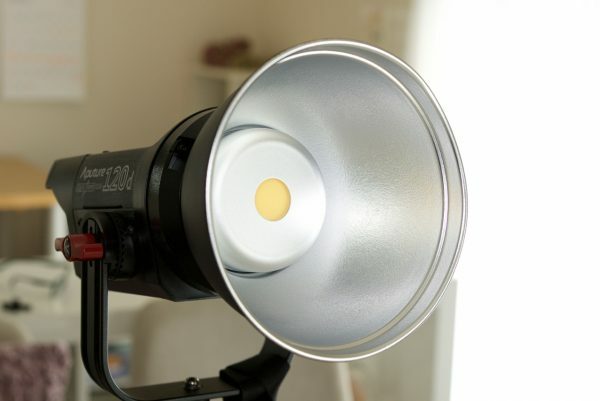 One of their newest lights is the Lightstorm COB 120d, which as the letter d hints at, is a daylight version (6000k) of their very popular 120t (tungsten) LED light. 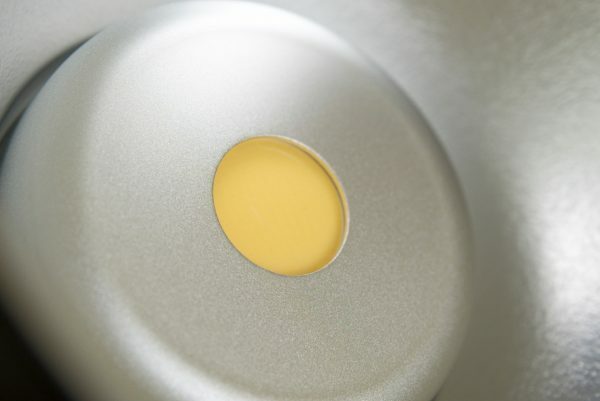 Quite a few new LED lights on the market, including the 120d, are using COB technology. COB stands for “Chip On Board” and is a relatively new form of LED technology where multiple LED chips are packaged together as one lighting module. The advantages of COB LEDs being multi-chip packaged, is that the light emitting area of a COB LED can contain many times more light sources in the same area that standard LEDs could occupy. This results in a greatly increased lumen output per square inch. The 120d is identical to the 120t in every way apart from the colour temperature it produces. The housing of the 120d utilises an all-aluminum construction, and according to Aputure it goes through over a hundred fabrication steps. Just like most other Aputure lights the build quality is very good. The light feels solid and robust and the locking mechanisms and power connectors are all well made. Despite the quality build of the light it only weighs in at 1.6kg (3.5lb). What I particularly like is that the locking mechanisms on the yolk frame utilise a rosette design so when you tighten them down there is no chance of the light moving out of position. This may be a small thing but I have seen much more expensive lights ship with very cheap and nasty locking mechanisms that don’t work properly. The 120d has a large fan on the underside of the unit as the high draw COB LED chip tends to produce quite a lot of heat. Along with the fan the fixture uses an intelligent temperature control system. 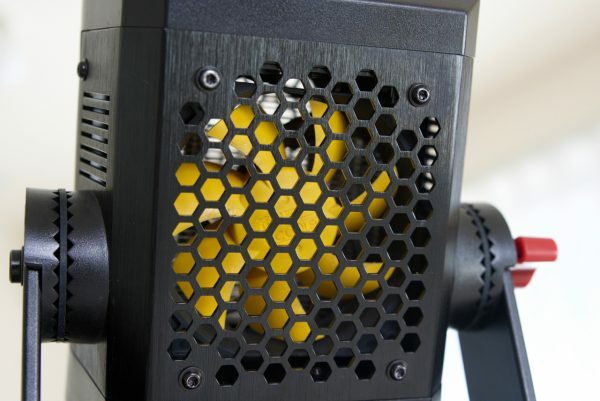 The fans rotation will be varied based on its measurement of the corresponding ambient temperature. The fans go to maximum rotation speed when you press the Auto/Force button. Despite the size of the fan, it is barely audible and I doubt you would be able to hear it even in the quitest of environments. The light itself doesn’t have any physical controls on it at all which is some regards is nice. Like all of Aputure’s larger lights, the 120d utilises a wired controller which is separated from the body of the light. This allows you to make all of your changes at ground level instead of having to reach up high when the fixture is on a light stand to try and make changes. By having the light head and the controller separately it also allows you to use more compact light stands that don’t take up as much space. The controller is on the largish size, but that is mainly because it does feature an in-built V-Lock or Anton Bauer Gold Mount battery plate. 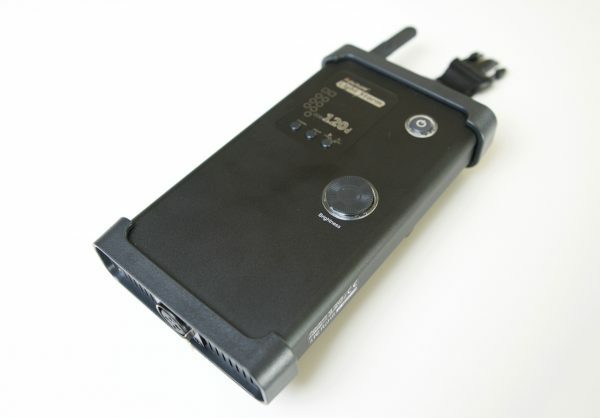 The 120d draws 135w of power so only certain camera batteries will be able to power it. If you travel a lot and plan on flying with this light this is something you need to be aware of. On the positive side the lights mains power is 100-240 VAC which means it will work anywhere in the world. Most Aputure lighting fixtures come with an included remote control, and the 120d is no exception. You can use the wireless remote to control on/off and dimming functions from as far away as 100m (328′). 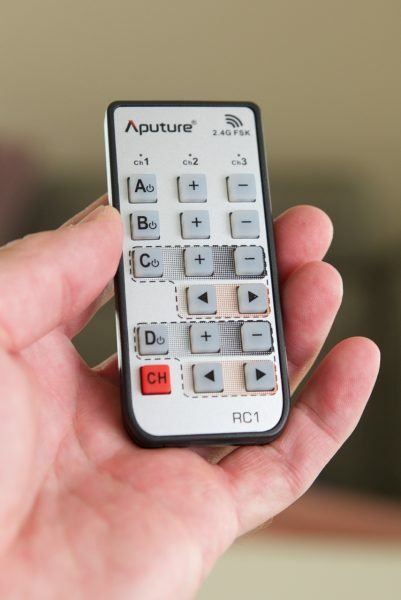 If you already own another Aputure light, that same remote control will work across all of the company’s lights. This is very handy as you can adjust up to three different lights all from the same remote control. As I usually operate as a solo shooter I love lights that have remote control capability. There is nothing worse than having to go over and adjust a light, then walk back to the camera to see what it looks like. You may find yourself doing this process numerous times. Being able to stand behind the camera and dim the light or turn it off or on is a real time saver. 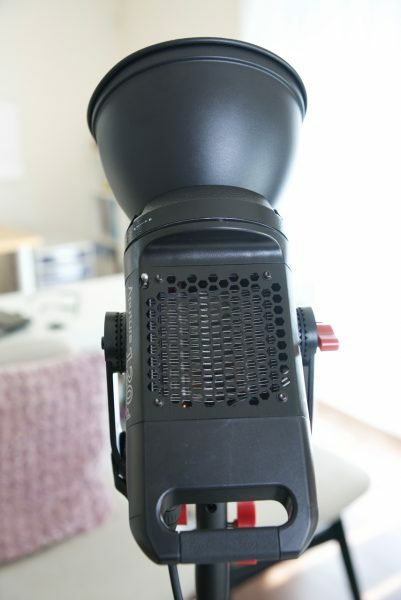 The LS C120d uses the popular Bowens-S photographic accessory mount which makes it easy to mount various lightning modifiers such as snoots and soft boxes. It comes included with a reflector dome that helps to both intensify and spread the lights beam source out over a larger area. My only small complaint with the reflector dome is that it does move around so if you were using the light outdoors in wind it is bound to wobble and create excessive noise. You could of course just use some gaffer tape to tape it down if need be. 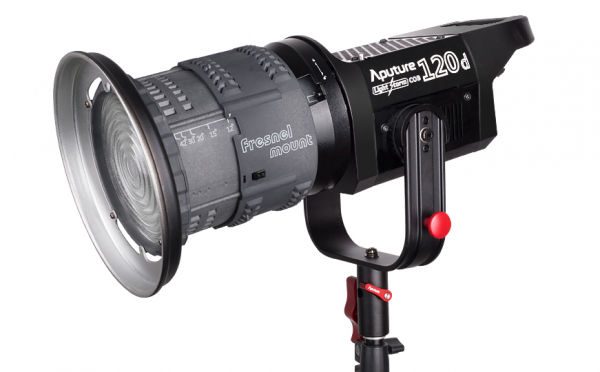 Aputure also make a fresnel attachment that makes the light incredibly versatile. 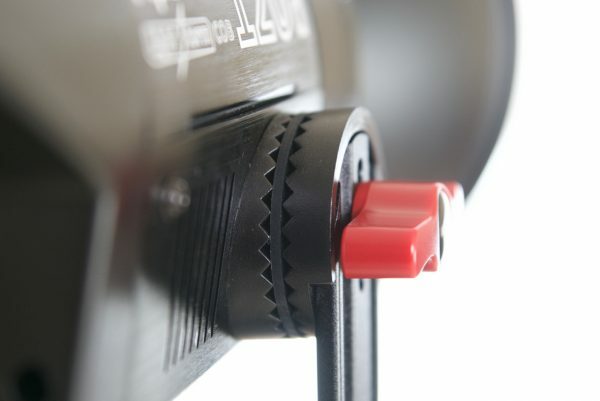 The attachment features an adjustable lens for flooding and spotting the light output from a 12°-42° beam angle. 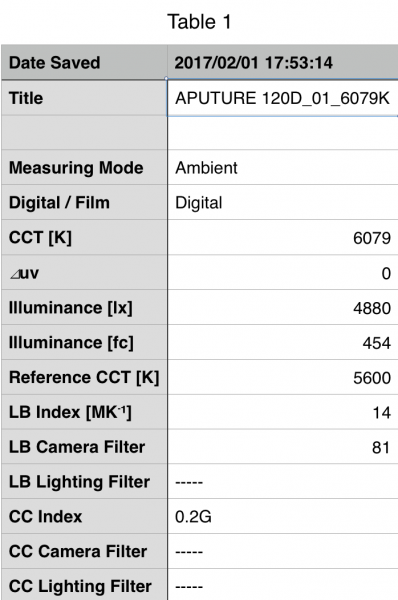 I haven’t been able to independently verify this, but Aputure claims the light intensity on the wide side is 14000lux, and goes up to a blinding 67000lux at a distance of 0.5M. Speaking of photometrics, I used the Sekonic C-700 to measure the lights output and colour rendering performance. The measurements were taken in a controlled environment with the reflector on at a distance of 1 meter (3.28ft). As you can see from the above table the 120d produced 4880lx. It was also extremely colour temperature accurate. Aputure state that the 120d is a 6000k light and from my testing it recorded a reading of 6079k and a perfect ⊿uv score of 0. This is one of the few lights I have ever tested to record a ⊿uv score of 0. For those who may not know, ⊿uv is the value to show how much this light is away from being an ideal light source (black body radiation = incandescent lamp). As with the CC Index you want this number to theoretically be zero. As far as the colour rendering goes, above you can see the light recorded an average CRI (R1-R8) of 96.6 and an extended CRI (R1-R15) of 95.0. For accurately reproducing skin tones it recorded 97.6 for R9 (red), 98.6 for R13 (closest to caucasian skin tones), and 97.1 for R15 (closest to asian skin tones). These figures were very impressive and tell me that the light is very accurate in producing correct colours. Spectral distribution of the Aputure 120d on the left and a tungsten bulb on the right. Even though LED lights have come a long way they still can’t re-produce a full colour spectrum. If you compare the Aputure 120d’s spectral distribution above to a generic tungsten bulb I have lighting my room you can see what I mean. A light with an ideal spectral distribution should have a straight linear line. 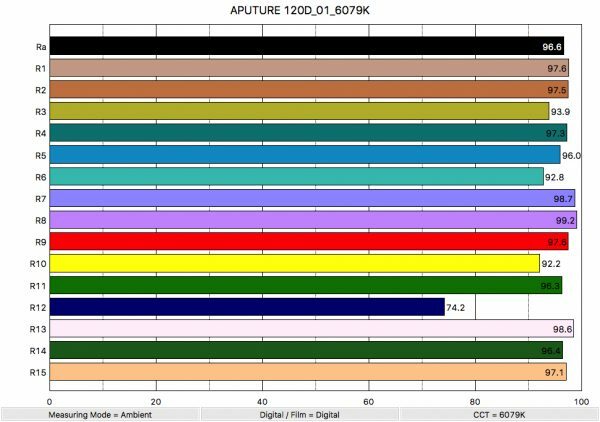 Almost all good LED lights will look similar to the Aputure with a very up and down distribution across the wavelength (nm). So now that the facts and figures are out of the way, what sort of scenarios would you use a light like the 120d in? 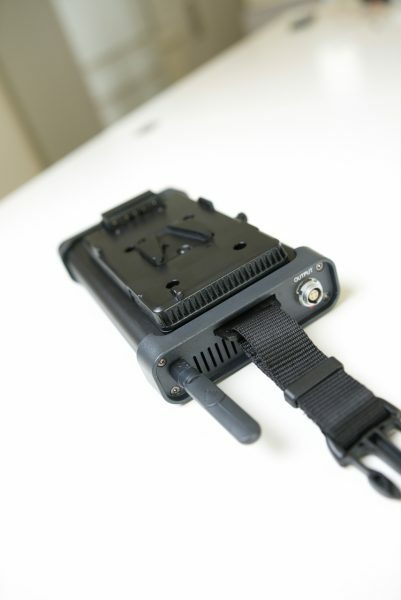 Well depending on what type of attachment you put on the front, the light could be used for multiple purposes. If you already own a lot of lights and don’t need this to be a multi purpose solution I would be inclined to use the 120d as a bounce light to create a nice wide/soft source. Just bouncing this light into a ceiling, wall or piece of polly board works really well. When you just need some extra light and don’t want to make it obvious that you are using additional lights then using it indirectly works a treat. You could of course ad the optional fresnel attachent to use it as a nice direct hard lighting source or throw on a softbox for a more diffused direct lighting solution. 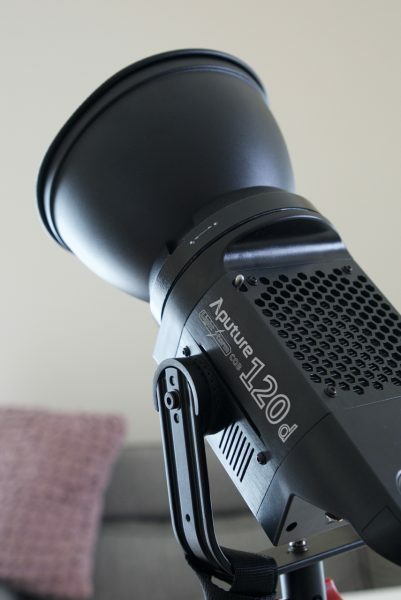 The great thing about the 120d is it can made to do a variety of jobs by adding very affordable optional accessories – Aputure’s light dome soft box for the 120d is only $149US. 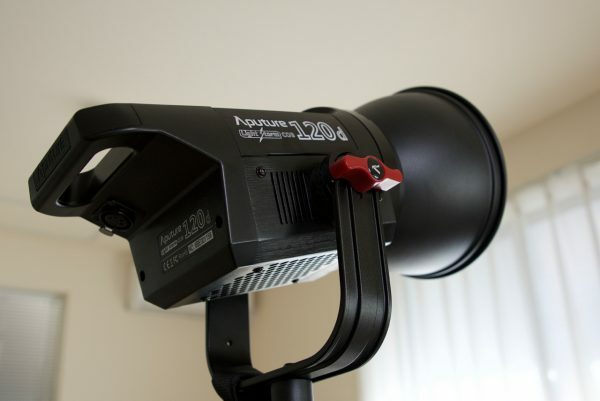 If you are on a tight budget and looking for a jack of all trades light, the 120d with a few optional accessories may be a very good option. I was very impressed with the 120d, it is a solid, well constructed light that can be adapted to be used in a variety of lighting scenarios. The fact that a vast array of affordable accessories are available for the light is to me one of its biggest selling points. Not only is it reasonably affordable at $595US, but it is also very colour accurate and produces a good level of illumination. To find out more visit the Aputure website.